Where to Find the Best Vegan/Vegetarian Good in Warsaw? We all know that polish cuisine is not the most vege-friendly one, Warsaw however is a paradise for no-meat eaters. From vegan sushi spots to vegan pizza places, you can find plenty of such restaurants or cafes all around the city and almost every restaurant offers vegetarian or even vegan options to satisfy everyone. One of the top places on tripadvisor is “Momencik” – vegan mexican food. We payed it 3 visits and all of them were great. The food is relatively cheap; costs appox. 15pln for small burrito which is actually enormous, so we don’t advise you to take bigger one. Service is great, friendly and english-speaking, plus you can get your belly really satisfied with portion they offer. What to want more? Tip: Don’t be scared of pineapple sauce on your burrito. Another place we’ve been to is Vege Miasto where we ate the best vegan meal ever – stuffed kale leaves that cost 29 pln but are definitely worth their price. At the spot you can find variety of dishes, delicious cakes or vegan wine. They have in offer lunch options as well: soup + main dish = 25 pln. Vege Miasto is always full of people and sometimes it’s hard to find a place to sit down. Veg Deli is an amazing place to take you date for dinner even if you are not vegetarian. Portions may not be big there but it’s all about taste. Combinations of ingredients in the dishes may seem to be crazy but I can assure you, every detail is well thought out. You will have trouble what to choose, I bet, because everything sounds great. The prices go up to 30 pln but it is a decent restaurant with great, romantic atmosphere. 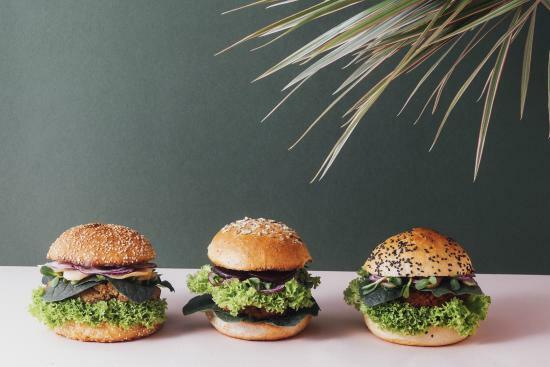 Krowarzywa Vegan Burger is a top place for vege burger lovers. Every week Krowarzywa offers different burger so it never gets dull. The food costs between 12-16 pln and it’s considered to be the healthiest ‘fast food’ in Warsaw. It is a nice place when you wanna eat good & fast. Tel Aviv Food & Wine is another healthy option for hummus-lovers. They serve lunches (for example we ate greek moussaka with spinach) for 25 pln including soup, main dish and aqua fresca. Service is extremely polite & fast and the restaurant has in the offer wide choice of wine. As well it is possible to get breakfast all day. After all, I am wondering if bad vegan places even exist here because our experience proves otherwise. They are always full of people and I don’t believe that only vegans go there. We are glad to be help! I can’t see on this list sushi bar Sakana – it’s on Moliera street. I think the best Tom Kha soup that I ever ate. I was in Warsaw with my friends last year and if i ll be there next time, im sure that i ll go try more tasty soups!